AMD looks prepared to update each of its mainstream and HEDT CPU lineups annually, and the third gen processors coming next year will most likely need a new chipset, since the red team is making the jump to 10 nm and even 7 nm. The upcoming Threadrippers are rumored to be accompanied by a new X499 chipset, which should bring support for PCIe 4.0 and DDR5. One year ago, AMD made it clear that its future Ryzen CPUs will remain compatible with existing X370 chipsets, even though an X470 chipset was released with the gen 2 Ryzen processors earlier this year. 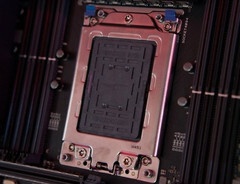 A similar promise was made for the Threadripper HEDT CPUs that were initially launched on the X399 platform. The launch of the gen 2 Threadrippers this year did not bring a new chipset, however. The only chipset available for the HEDT sector is still the X399, but, according to HD-Technologia, this could change in 2019, when a rumored X499 platform would be launched. To confuse things a bit, Intel is also aiming to release a new X599 platform for the Cascade Lake HEDT CPUs. This should be launched in late 2018, while AMD’s X499 is rumored to be announced in early 2019 at an AMD Tech Day event held at CES. This new platform from AMD could be needed to support next year’s Threadripper 3000 series that is expected to make the jump to the 7 nm manufacturing process. Other rumored specs include PCIe 4.0 and possibly DDR5. While the mainstream CPU market is still disputed between Intel and AMD, the HEDT sector is clearly dominated by AMD with the Threadripper solutions, and since AMD intends to release yearly updates to this series, Intel will have a very hard time if it wants to keep up with the red team.